Alvinus J. “Al” Thull, age 80 of New Munich, passed away on Thursday, April 4, 2019 at the Tree of Life Assisted Living in New Munich, Minnesota. A Mass of Christian Burial will be held at 10:30 a.m. Tuesday, April 9 at Immaculate Conception Catholic Church in New Munich with Rev. Daniel Walz officiating. Interment will be in the parish cemetery with military honors by the Melrose Veterans Honor Guard. 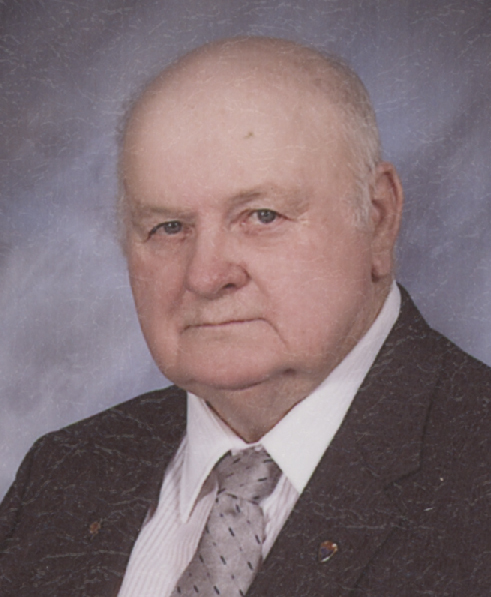 Visitation will be from 4 to 8 p.m. Monday at the Patton-Schad Funeral Home in Melrose and from 9:30 to 10:30 a.m. Tuesday at Immaculate Conception Catholic Church in New Munich. Parish prayers will be held at 5 p.m. followed by the Catholic Order of Foresters at 7 p.m. Monday evening at the funeral home. Alvinus John Thull was born May 4, 1938 in New Munich, Minnesota to Alphonse and Anna (Welle) Thull. Al enlisted in the U.S. Army and served in Korea. On June 28, 1961 he was united in marriage to Marcella Schwindel at St. Michael's Catholic Church in St. Cloud. Al farmed west of New Munich until his retirement in 2004 but remained active helping on the farm until 2011. He was a member of Immaculate Conception Catholic Church in New Munich, St. Leo Court 786 Catholic Order of Foresters, and the Two Cylinder Club. Al enjoyed fishing, reading and watching westerns, and enjoyed his trips to the Eagles Crossing. Survivors include his children, Duane (Rhonda) Thull of Oldham, South Dakota, Allan (Therese) Thull of Maple Grove, Judy (Rick) Rotzien of Blaine, James Thull of New Munich, and Dean (Delrita) Thull of Albany; 11 grandchildren; brothers, Roman and Donald Thull; and sister, Valeria Gerding. Al was preceded in death by his wife, Marcie Thull on May 18, 2017; parents; granddaughter, Jacqueline Thull; brother, Marvin Thull; and sister, Dorine Salzl. Serving as casket bearers will be David Schwindel, James Schwindel, Jordan Thull, Matthew Rotzien, Benjamin Rotzien, and Jakob Thull. Cross bearers will be Isaac and Caleb Thull and scripture bearer will be Kristyne Thull. Honorary bearers will be the Catholic Order of Foresters.